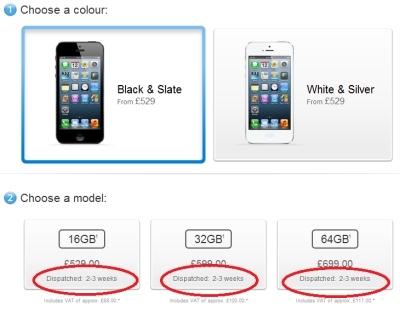 Within hours of the forthcoming iPhone 5 becoming available to order on the official Apple Store website it was out of stock. The current estimated dispatch time is "2 to 3 Weeks" for both the black and white colours and all different memory sizes. The U.S. Apple website paints exactly the same picture the other side of the pond. If you really want an iPhone 5 directly from Apple it now looks like you had better get set to camp outside your local Apple Store for when they open their doors on the 21st September. Apple fans famously love to be one of the first in queue to get their hands on the shiny new gadgets with queues around the block always guaranteed. Meanwhile, mobile phone vendors and network operators are still taking iPhone 5 pre-orders and appears they have yet to run out of their initial allocation. Dial-a-Phone, Phones 4 U and Three are all currently are taking orders. The deals on offer vary with Dial-a-Phone even offering a deal with no upfront cost. Before the end of the year, iPhone 5 users in the UK will be able to access Everytime Everywhere's (the rebranded Orange and T-Mobile) new 4G network which is currently being rolled out to the main cities throughout the country. This new super fast data connection, based on LTE technology, will provide a totalling new surfing experience to users with the extra capacity meaning no more waiting for web pages to buffer.